Isabella Ross died at Roadside Swiney 15th May 1914 aged 68. She sleeps in Jesus and is blest from earthly troubles she's at rest. 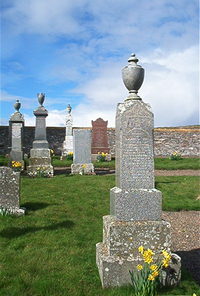 Husband Robert Macdonald died 1st March 1932 aged 85. Erected by husband and family.